The Perth Mint's lunar series has been incredibly popular since its first release, and this 2017 edition will continue the stellar tradition of excellence from the renowned Perth Mint. A landmark coin series of the highest regard, the Perth Lunars package beautiful designs, limited mintages and universal appeal all in one program. 2017 marks the first year of the Silver Lunar coin being minted in .9999 fineness, increasing its desirability to both collectors and investors. Each coin is struck from 1oz of 99.99% pure silver and finished in a stunning range of popular numismatic treatments sought after by collectors and gift buyers. 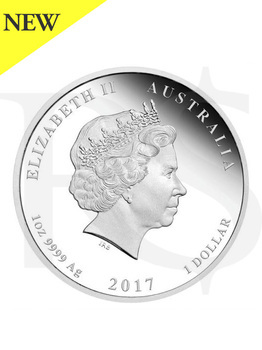 Issued as legal tender under the Australian Currency Act 1965, the Ian Rank-Broadley effigy of Her Majesty Queen Elizabeth II, the 2017 year-date, and the monetary denomination- “1 DOLLAR.” are shown on each coin’s obverse. The Perth Mint will release no more than 300,000 of the 2017 Year of the Rooster 1oz Silver bullion coin. 10th release of the Lunar Series II program. Obverse features the right-profile portrait of Queen Elizabeth II. Reverse bears the new Year of the Rooster design. Part of the Perth Mint’s Lunar Series II program. Click here to see annual Perth Silver Lunar Series II mintages.